Rabbi Ishmael’s Rules Nos. 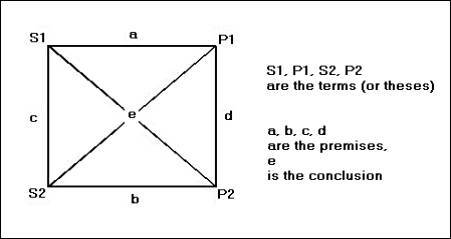 8-9-10, which are some of the Talmud’s harmonization rules, are all concerned with the following logical problem, formulated with reference to the following diagram: knowing the lateral relations between four items (the terms or theses, S1, P1, S2, P2, in the four premises a, b, c, d), what are the diagonal relations between them (i.e. the conclusions, e)? Such arguments appear much simpler, if viewed as successions of Aristotelian syllogisms (which involved three items, in two premises and one conclusion). They may then be graphically represented, using Euler diagrams. Their formally valid conclusions are then manifest for all to see; and the invalidity of some Rabbinic conclusions is then apparent.